I love heeling with my dogs. I love that it builds from and reflects the connection we feel and share. I love looking down and seeing my dog’s HAPPY face looking up at me as we move through space as one. For me and my dogs, heeling is great fun! It’s just another game. I try to turn all my students on to the fun game of heeling. That it’s excellent training and foundation for several Dog Sports are simply added bonuses. While playing heeling games, I’m always amused by the feeling of “I can’t shake my dog – unless he’s cued to wait or stay – he’s stuck to me like glue!” 🙂 Left turns, right turns, about turns, figure 8, slowing our pace, increasing our pace, coming to a stop, fronts & finishes, moving downs, moving stands, etc. The list of fun skills while heeling goes on, especially in the sport of Rally which includes weaving, spirals, jumps and more. Cyber Rally O has been especially enjoyable for me lately with its strong influence from Freestyle combined with its advanced / complex obedience skills. My dogs also find heeling fun, enjoyable and amusing. Chibi has a most endearing laugh and he often does it while we heel. Its infectious and makes me laugh. As I walk across the yard, I often have several Posse dogs casually but purposefully hanging out at my left side as if to convince me it’s time to train, each one hoping they’ll be first in line. 😉 Heeling, Obedience and Rally are definitely skills and Dog Sports the Posse and I have great passion for and enjoy together. It shouldn’t surprise me that I found myself heeling as a way of coping with the enormous loss of Geronimo. It happened effortlessly, naturally. I wanted to ensure Piglet, GingerPeach, Rocky, Chibi-chan and Penelope had ample and healthy outlets for their grief as a result of Geronimo’s death. Yes, we took, and still take, many long walks together and romps in our field and play with toys, etc. As for training, we found ourselves immersed in Rally – Cyber Rally to be precise. Why Cyber Rally? Because not only does it have the aforementioned influence from Freestyle (a sport I’ve been eager to dive into as I work through my “to do” list) and advanced obedience skills, it does not require us to travel or attend a live show, neither of which we are up for during this time of grieving. I have been referring to these sessions as “healing heeling” since that is exactly what they’ve been for me and the Posse. The healing heeling actually began the last week of Geronimo’s life. G’ and I enjoyed playing, connecting and communicating through heeling and Rally, and were able to film three CRO courses to earn his CRO-I. The first week without Geronimo, Piglet and I began practicing the stations for Level II Performance Division of CRO. (Piglet earned her CRO-I Title June 2012.) Performance Division of CRO requires the dog to work on the handler’s left and right sides, transitioning from one side to the other as the stations indicate during a course. There are many different stations which involve a transition, e.g., with a 90 degree turn, with a 180 degree turn, while heeling forward. Piglet and I currently use a leg weave (dog goes under handler’s leg and ends up on the other side of handler) for our transitions. It’s a skill we’ve known and enjoyed for many years. Level II also has jumps and other stations not found in Level I nor other Rally venues. Piglet is an incredibly quick learner, she has always amazed me. Her confidence in learning and to try is off the charts. In addition, she has excellent body awareness, proprioception and is extremely agile. She also has a wonderful sense of humor! She is currently 11.5 years of age, I hope we share many more years. 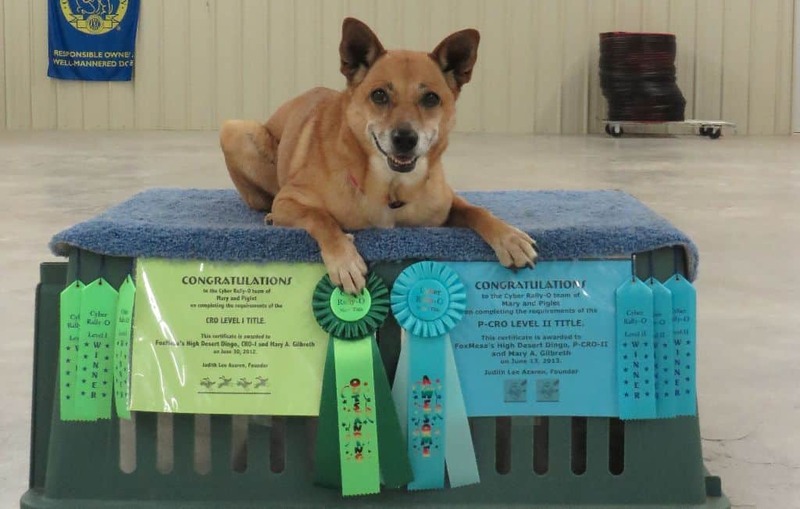 On June 13, 2013, 1.5 weeks after Geronimo went to Rainbow Bridge, FoxMesa’s High Desert Dingo “Piglet” earned her Level II CRO Title in the Performance Division (P-CRO-II), with her Posse mates supporting her from the sidelines. This training and the performances came at a painful time for the Posse and me, but they brought us closer together and brought us some peace. These CRO runs and Piglet’s P-CRO-II Title are in honor of Geronimo. Piglet’s performances are below. Thank you for reading and watching. It’s only when we truly know and understand that we have a limited time on earth – and that we have no way of knowing when our time is up – that we will begin to live each day to the fullest, as if it was the only one we had.